What’s a nice soldering iron? So, I broke my third cheap soldering iron and I’m now ready to get something nice that will last me a long time. Any recommendation? Weller have a good rep. I have a cheap unbranded solder-station, but it is temperature-controlled, and has lasted me a good few years. I’d recommend getting a temp-controlled solder-station, rather than a simple iron. Hakko FX-888D is well regarded. I don’t own it myself, but it’s kind of a legend. I’ve recently acquired the TS100 iron, and it’s amazing! There is yet no data on reliability because it’s very new, but it looks like a new generation of soldering tools for hobbyist. I just wanted to get something small to complement my huge Aoyue soldering station, but it looks like TS100 is going to be my main soldering tool now. My second and third one were temperature controlled, but not very reliable, apparently. I have a Hakko FX-888D, and it lives up to every positive word about it. It has made soldering so much easier. The temperature control is immediate, and I can’t remember any cold solder joints with this iron. It’s pricy, but not too bad. I think it was around $100 (USD). 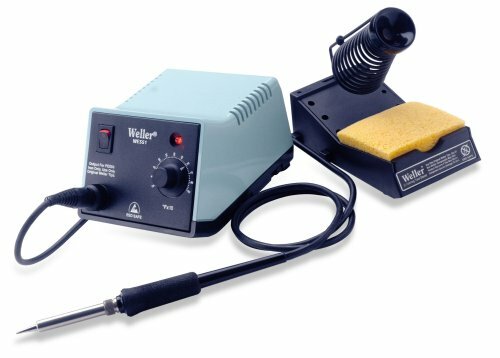 Weller is also a good brand, and has a similar quality soldering station, but at that point, might as well spring for the Hakko (just my opinion). Plus, the Hakko is solidly built and looks nice sitting on your desk! is what we have. it hasn’t seen much use in the past few years but there was a point where I was using it daily. I have one a bit like this, it’s been reliable so far (5 or so years). Another vote here for the Hakko FX-888D. I had cheap irons for years. I was able to build and repair through-hole equipment, but it was always frustrating and there were occasional casualties. The Hakko gets up to temperature in abut 30 seconds and is fantastic. I’ve built 10 microcontroller-based eurorack modules with surface mount components using it. OTOH, many cheap soldering irons are clones of big brands, so tips are compatible. My Aoyue soldering station uses Hakko tips. Thanks all; I’ve ordered a Hakko FX-888D. Looking forward to giving it a try! it’s a good 'un. My only recommendation would be that I don’t really like the standard tip - it’s a pencil/needle tip, which never feels like the best way of transferring heat. I like the ovoid chisel tips which have a flatter, wider surface area at the end - T18-C2 or T18-C3 feel the right size for me. Tips are easily available and cheap on ebay. So if you don’t get on with the pencil tip, remember there are others! I’ve used a Weller WP25 for years with the pencil tip. Never found a need for temp control, and would avoid the chisel tip like the plague when working with modern circuit boards or fixing guitar cables & jacks, etc. The pencil tip will deliver plenty of heat. Make sure you wait for it to warm up fully before using, and keep the tip tinned properly-- a wet sponge nearby and a decent pump desoldering tool are must haves as well.